Watch Saturdays, December 27, 2014 & January 3, 2015 at 9:30am on WMHT TV. 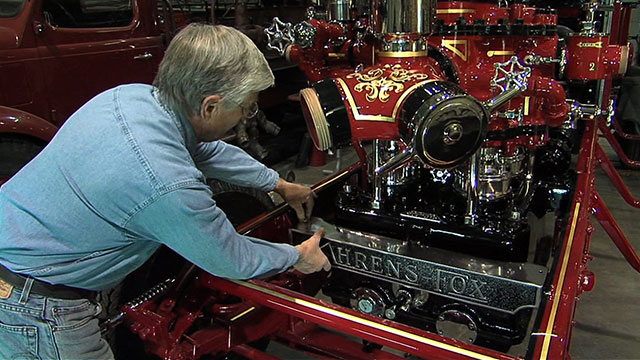 ULTIMATE RESTORATIONS showcases the rescue and restoration of some of the most valuable mechanical icons of the Golden Age (1880-1940), a high point in innovation and craftsmanship. The series, hosted by Bob McNeil, tells the spellbinding stories behind eight of American history’s greatest historical and engineering treasures — the world’s largest pipe organ; a surviving 1920s fire engine; a “fish car” designed to transport live fish by train; a priceless carousel; a World War II spy plane; one of the first U.S. yachts to round Cape Horn and a famous steam locomotive. The passionate restorers and committed craftspeople discuss the challenges associated with reviving these massive icons to their original glory: moving huge pieces of equipment, salvaging from sea-floor beds, searching for rare parts, and dealing with complicated mechanical systems.